I made this card for Kirby to give to his wife, Gail. Their first date was on New Year's Eve 40 years ago. He gives her a card every year and I think I've made them for the last 6 years or so. Love to be a small part of their celebration. 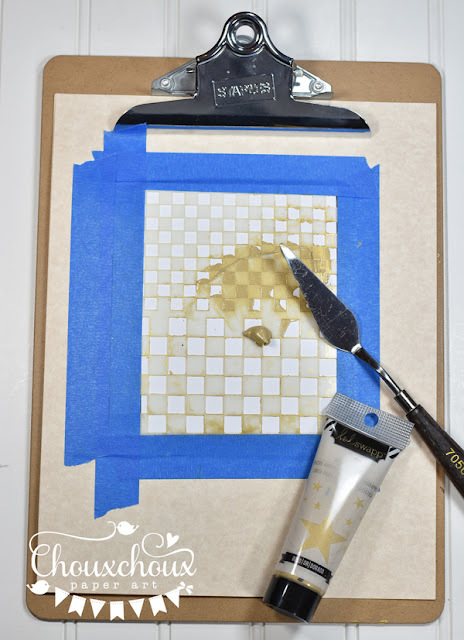 Have you tried any of the Heidi Swapp Art Screen Ink? Its a lovely product, you can see how the gold shines. It's pretty easy to use. Tape your stencil on top of your paper and swipe on with a palette knife (or something similar). Gently pull it all off and clean everything with some soap and water. When it dries, you've got a fun, textured background. You can download the sweet vintage postcard below. It might be a little late for this year - but maybe one of your New Year's resolutions is to plan ahead? Obviously, it needs to be added to my list! I printed it so the clock would fit the die cut clock. I printed two and cut out the little girl to pop on the top. I also used a gold pen to write over the word Resolutions on her scroll so it would show up a little more. 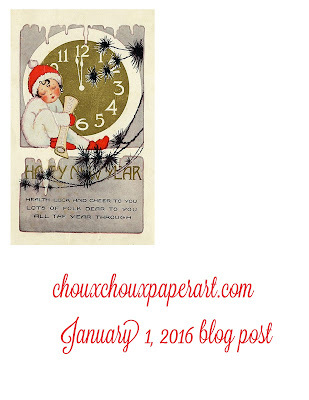 Download the New Year Postcard HERE. Happy New Year Lori! What a darling image and card. I haven't tried that technique and it looks like fun! Thank you for the sweet image. Wow, fabulous card! 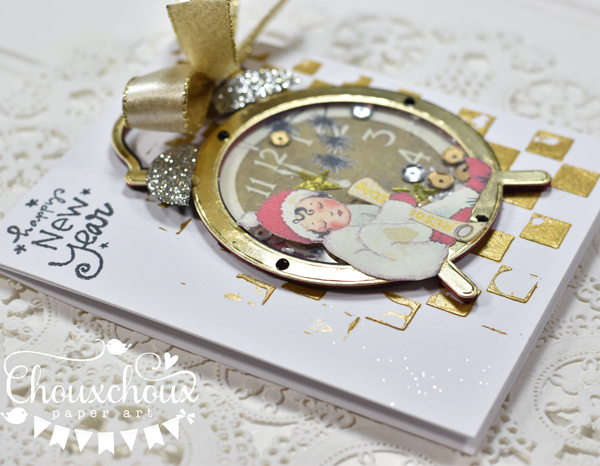 Love the stenciled gold background and the sweet image! The hubby of your friend will have loved it surely! Such an adorable card Lori - thank you so much for sharing the image. Happy New Year to you. I hope 2016 brings everything you hope for. Your card is delightful -- for me it is one of the best!! 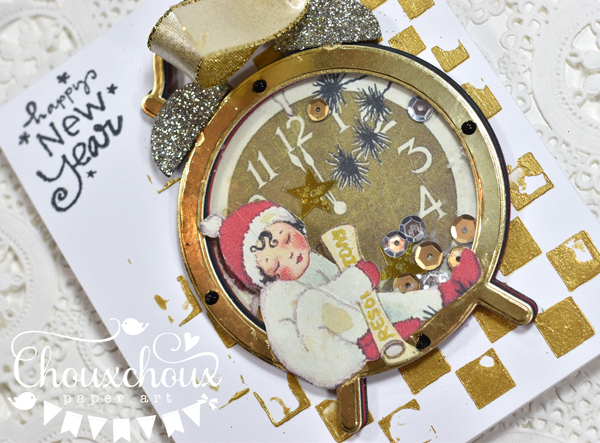 Your card is so adorable to ring in the new year! Love all the touches of gold! Happy New Year to you and family! This turned out so adorable!!!!!! I love every little detail!! Haooy New Year my friend! Lori! I just was thinking I hadn't been here in a couple weeks almost so I figured I better see what you've got going on and I'm so glad I did! I LOVE this image and I LOVE what you did with it... beautiful... and I think I need to buy some of that screen ink... on the list! Happy New Year!!! See you again soon. Happy New year Lori..wishing you a wonderful 2016! 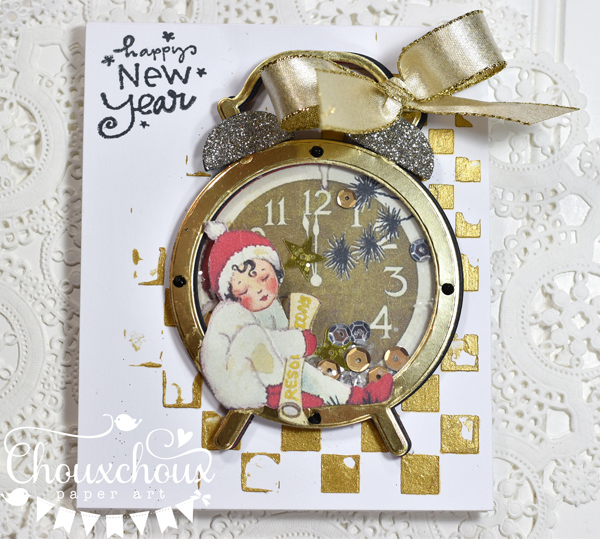 Your card is so pretty, love the sweet image,gorgeous design! Yep, and like Lisa I will definitely be buying some of that screen ink! You make me want that Heidi Swapp ink--love it & love your card--so pretty! So glad I had seen this post before I went to JoAnne's recently. They had the Screen Ink on close-out--no gold, but I got the silver to try. How to Make A (Super Easy) Paper Daisy!